You may have noticed that there has been a lot of snow recently. Sure it’s all pretty and fluffy when it’s falling down, leaving a (little more than a) dusting of white on everything it touches. What would winter be without some snow? Summer, that’s what. But all things must come to an end, and as March approaches I feel I must remind you that this snow won’t be with us forever. You look around right now and you might think that it will be, but alas, time Marches on (see what I did there?). Unfortunately, snow doesn’t just disappear. It melts. And if you think way bay to your first grade science class, you may recall that snow is made of ice, and melted ice turns to water, and water makes things wet. 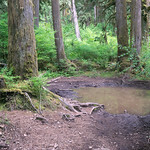 And if you think back to first grade recess, you may recall that water plus earth equals MUD! 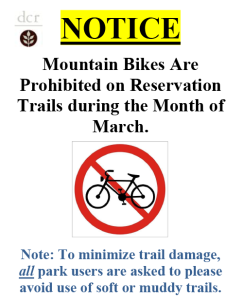 With all this snow will soon come lots of mud, and with that March mud in mind, DCR kindly asks that you refrain from mountain biking in the Fells during the month of March. 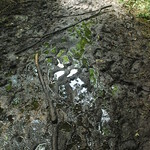 If you plan to hike, you will still want to watch out for the mud and do your best to avoid soft or muddy trails to minimize damage. Another fun science fact: the sun makes water evaporate, and when the water evaporates from the mud, it goes back to just being dirt. 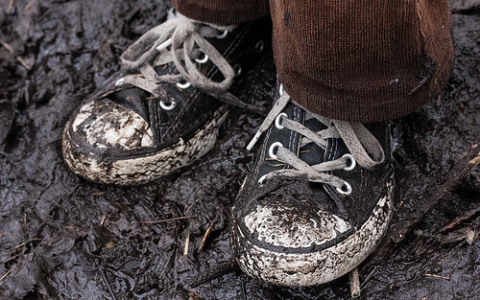 And if there are tracks left in that mud when it turns back to dirt, they are going to be there for a while. 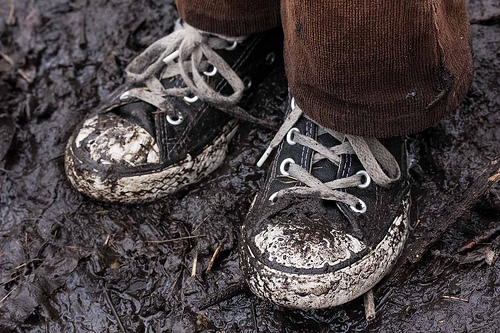 The same holes will fill with mud every time there’s a little rain, and the trails we love will become the trails we bring home with us on our shoes. 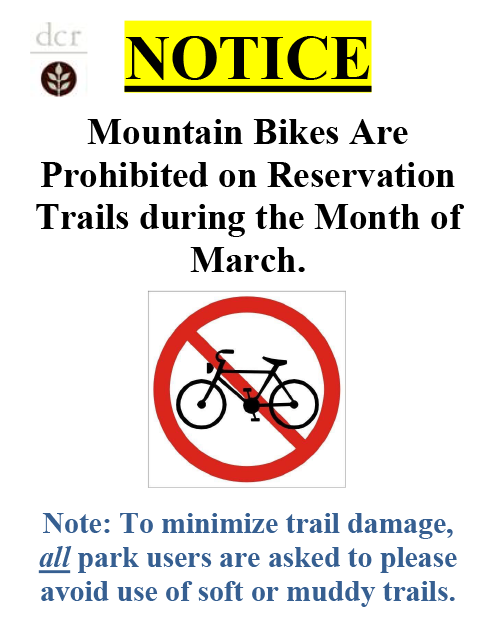 So, please, be a real Friend of the Fells and help DCR keep our trails in tip-top shape this spring. Thanks.